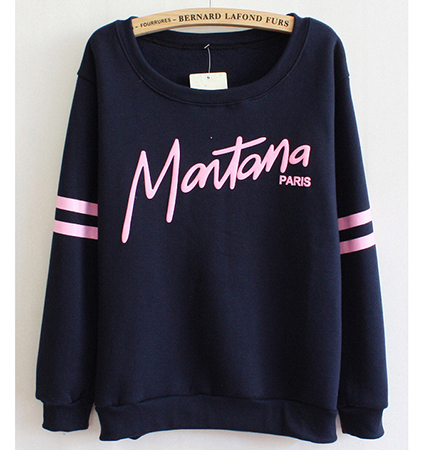 Proclaim your love of the world famous Montana Paris clothing line with this comfortable and stylish women’s sweatshirt. Made from a comfortable and durable blend of cotton, this sweatshirt can be safely machine washed and tumbled dry on a low heat setting. It features a loose fit, long sleeves, rounded neckline, and the words “Montana Paris” emblazoned across the front in a pink script. This women’s sweatshirt is available in your color choice of white, red, green, navy blue, or light gray. Even when you’re dressing for comfort, this sweatshirt will ensure that your fashion game is always on point.